Last September we were in PA so we decided to see what the place (York Fairgrounds) looks like when it's not a Train Meet. Here's a few pics... see if you can spot a few "landmarks"
I think that guy on the left is saving his spot for the next train meet! some guy comes along and hijacks MY spot to put up a sausage stand !!! ARRRRGGGHHH! FYI: I like "our" York better! Yes it is Billed as America's Oldest Fair. Here is a site for your reading. I've attended 2 other "Yorks"...a Greenberg train show (every January in the Orange hall), and a International Postcard Show (every November in White Hall). They tend to show how big our TCA Meet really is, in that these other 2 only fill one hall. Hmmm, it does not seem like a lot of folks were attending the fair. 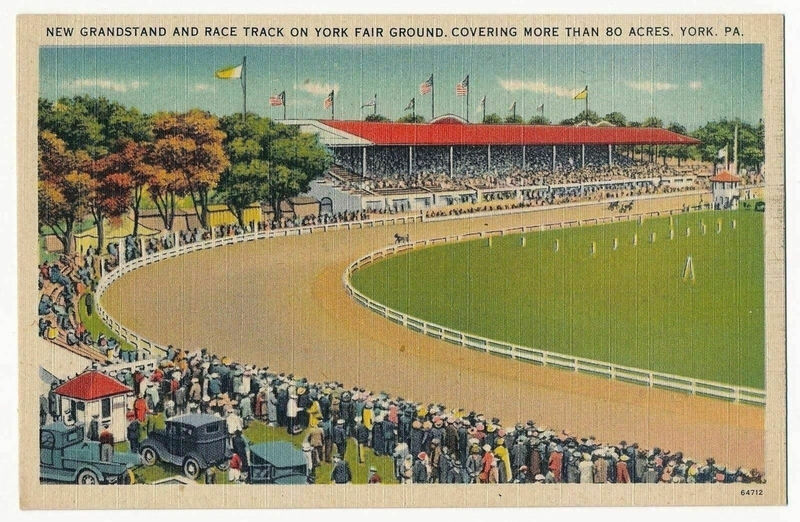 A few yeas ago I came across a bunch of postcards from the 1880s to 1910s which had pictures of the York Fair from the time period. I found them to be an interesting piece of history. My only other trip to York was the PA Jeeps All Breeds Jeep Show. Nothing in the halls, but every bit of grass covered with Jeeps, including two of mine. Ones showing anything besides the race track are hard to find. There seems to be a Model Train sign on the building behind the goats. Were there trains at the Fair ? Yes, there was a modular club in the "black hall" where we see 'em at York. They had some nice modules! Made it there twice, non-TCA, once for a train show!, only in what was Blue Hall, promoted by guy from Harrisburg who had right of door table in "Sheraton" during TCA. Another time was vacation detour and found a dinnerware and glass blow-out sale in another building. Have also seen a motor home show there just prior to TCA. Made it there twice, non-TCA, once for a train show!, only in what was Blue Hall, promoted by guy from Harrisburg who had right of door table in "Sheraton" during TCA. That was probably the late Charlie Phillips.